This is Little Bear. She was a best friend to my sister’s family for years and years. I remember the first time I ever saw her. 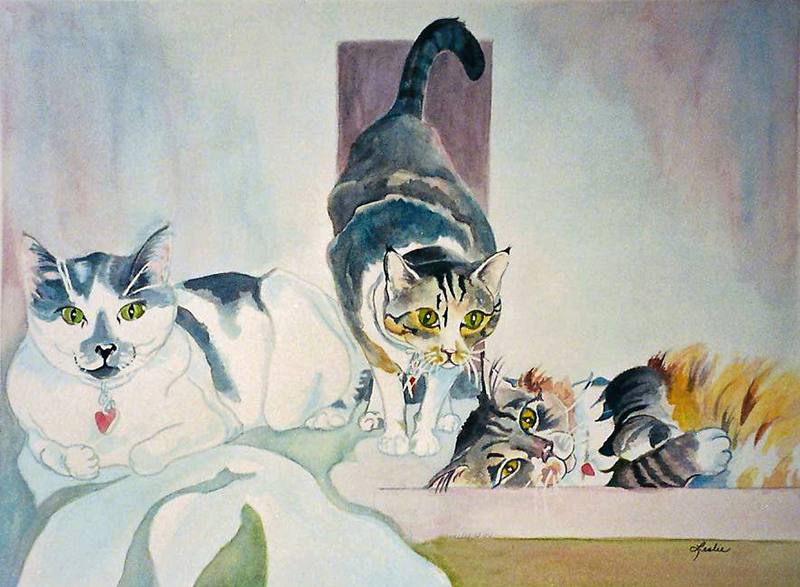 She was hanging upside down on a gutter outside the family room window and had grabbed a small wooden birdhouse, hanging there, between her front paws. She was peering into the hole in it. I laughed so hard. I painted her once before here. The above painting required some planning. I had a photographic reference sent to me from my daughter of this cat laying on his back, his favorite pose. I tried to lay it out and come up with some way to paint him that might be interesting, other than just him in paint. I finally decided on using another reference photo where there were a large assortment of overlapping grasses and combined the two. I also decided to use a sheet of masa paper to enhance the texture and maybe create more interest. I have a tutorial on how to prepare and use masa paper with watercolor here. The above is my take on a lunar landscape. The above painting is a gouache resist. I was attempting to create a composition using shapes. I describe how to create a gouache resist here. 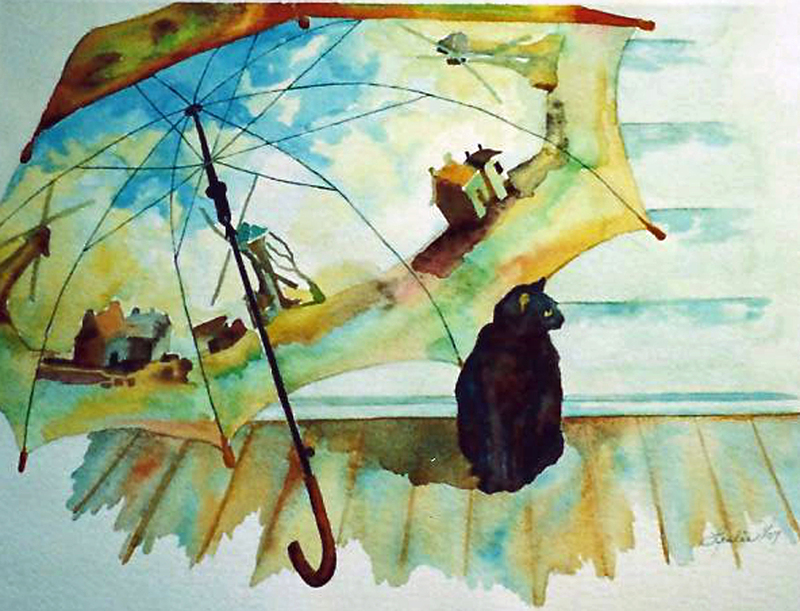 The above painting is a portrait of my sister’s cat, Little Bear. 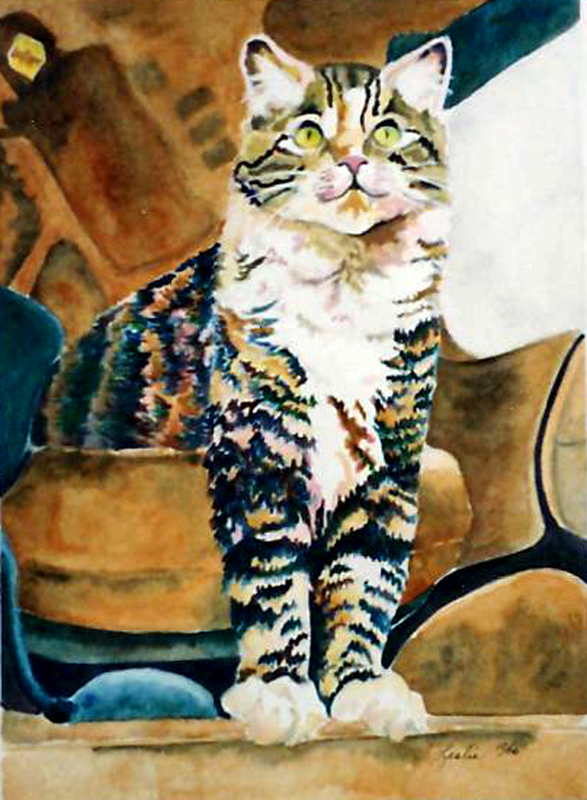 I have always wanted to paint her just to see if I could capture the look of her tabby marked coat. 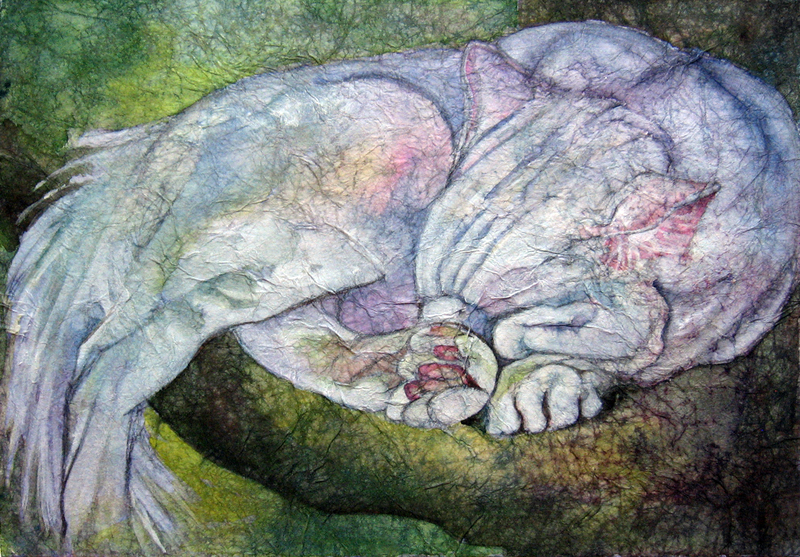 I used frisket for the spindly white in the grasses, whiskers, and highlights in the eyes. A post about frisket is found here. My sister’s other cat can be found here. The above image was designed using a photo that my sister sent me of her cat, “BOO”, thinking he had hidden himself in the grasses around her home. The image was somewhat fuzzy and I felt I would not do him justice in watercolor. My creative drawing class will soon be working on a project where they will be asked to draw or paint with paper so I decided to give this image of Boo a go with that in mind. I decided to use papers that I created from National Geographics treated with the cleaning agent Citrasolv. For a tutorial on how to create these papers click here. I usually spend some time preparing and drying these papers, in advance, so that I have them stored for when I need them. The above is the first step in my process of creating Boo. I drew him on a piece of 140 lb coldpress watercolor paper. I only include those lines that I feel are necessary to guide the bolder shapes as they are soon buried by the papers. I began with his eyes. I found a yellow page that had turqouise bubbles to use for his eyes. In order to get the shape correct, I first traced the shape of his eyes using tracing paper, cut them out and used those cut outs as a pattern over the colored paper to cut out the shapes I needed. This is how I work. 2. Cut out the shape on tracing paper. 3. Lay tracing paper over the colored paper I wish to use and cut that shape out again. 4. Glue it to the surface where needed. I am careful not to cut out HUGE shapes as they tend to wrinkle more. I use acrylic matte medium as my adhesive. 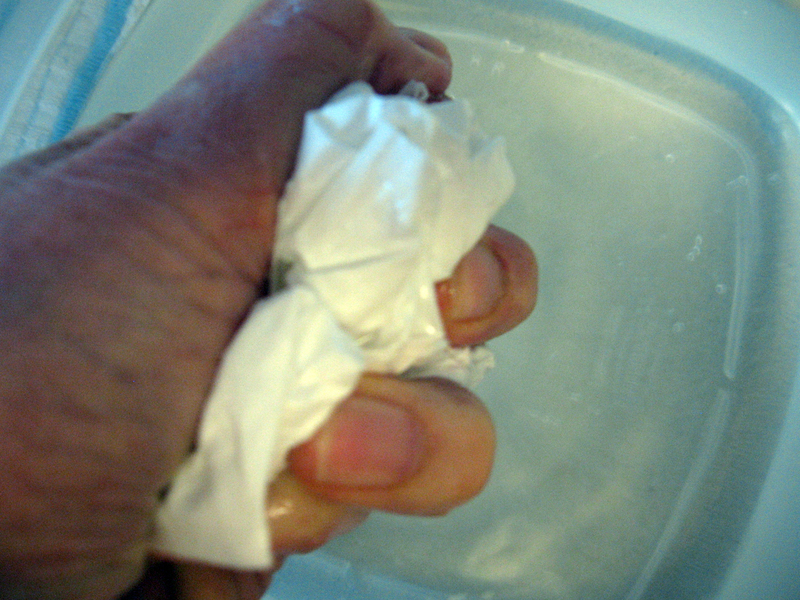 Sometimes I mix small amounts of water with it if it begins to thicken while I am working. I then began cutting and glueing shapes for the background. I chose papers of the same value range as I was going to use for the cat because I wanted him to appear somewhat hidden. 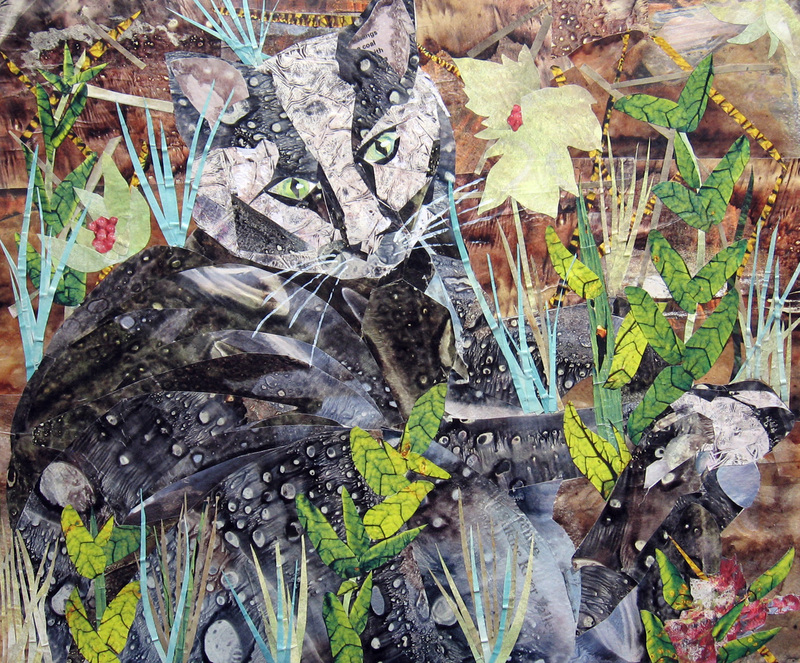 I chose warm colors for the background of the earth and cool colors for the cat so that there would be some differentiation and so the viewer could find the image. I tried very hard to create an interesting composition of colors so that the background looked like a painting. 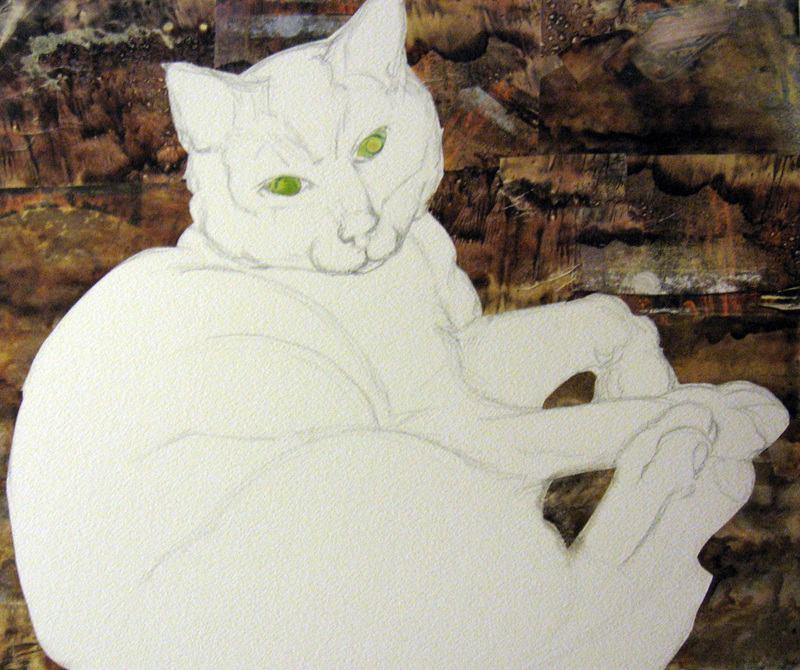 I then begin to draw and paint the cat’s shapes with paper. Note that I cut crescent shapes of paper for his belly and several pie shapes for his haunches. This helped to give him a three-dimensional quality through the use of cross contours. Had I cut out one large piece of paper for the entire body of the cat, he would look fat and the paper would have wrinkled. I did not want him to appear as a silhouette. The next step was the most difficult. This was because there were many variations of values and shapes needed to describe the face and paws. The paper shapes were tiny and difficult to glue down without them sliding around. I used a q-tip on some of them to rub them down flat, rather than my paintbrush. (I save aside several brushes to be used only for glueing with matte medium as they become stiff and damaged over time). There are 53 pieces of paper in the cat image, alone. By this time, I am actually feeling as though I am drawing and painting with the paper, for sure. The final step was the most fun. I divorced myself from the photo reference and designed my own grasses and plant shapes to furthur camouflaging Boo. I worked them in and out and through his form to furthur increase depth. I was very careful to save parts of him that I wanted to show thru. 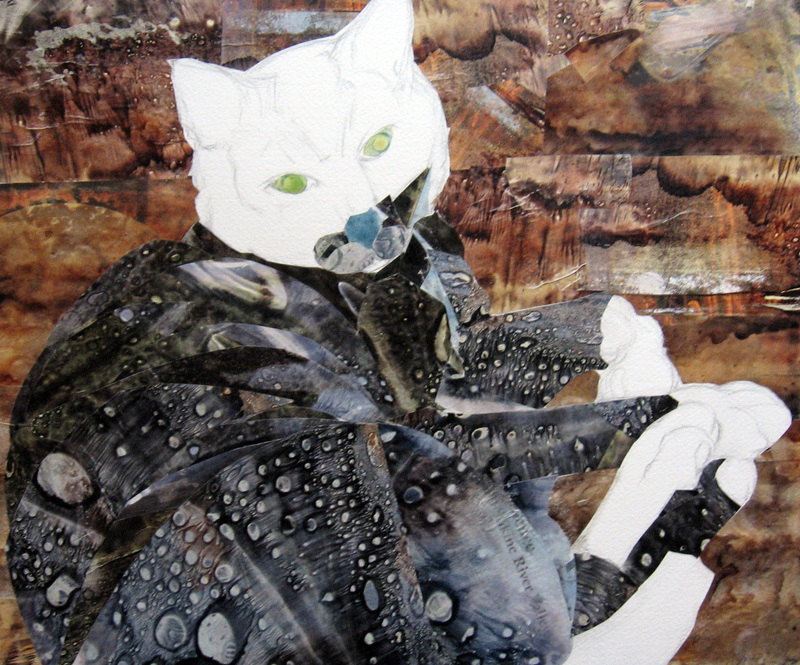 The final step was to add whiskers and highlights to the eyes with white acrylic paint. 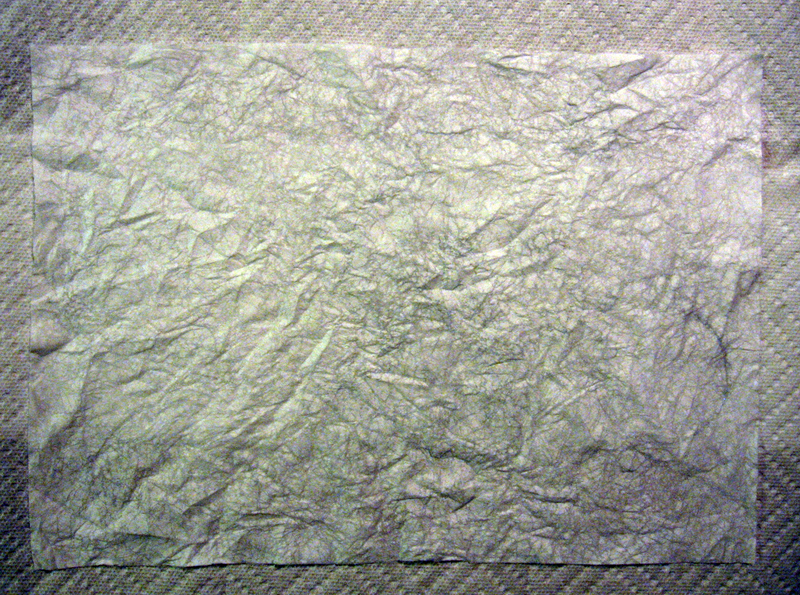 I have used these papers once previously to create a selfportrait, found here. I thank Carol King for having originally introduced this process to me here. More Citrasolv art may be viewed on the artist gallery page of the Citrasolv website here. I am still exploring masa paper, so new to me. 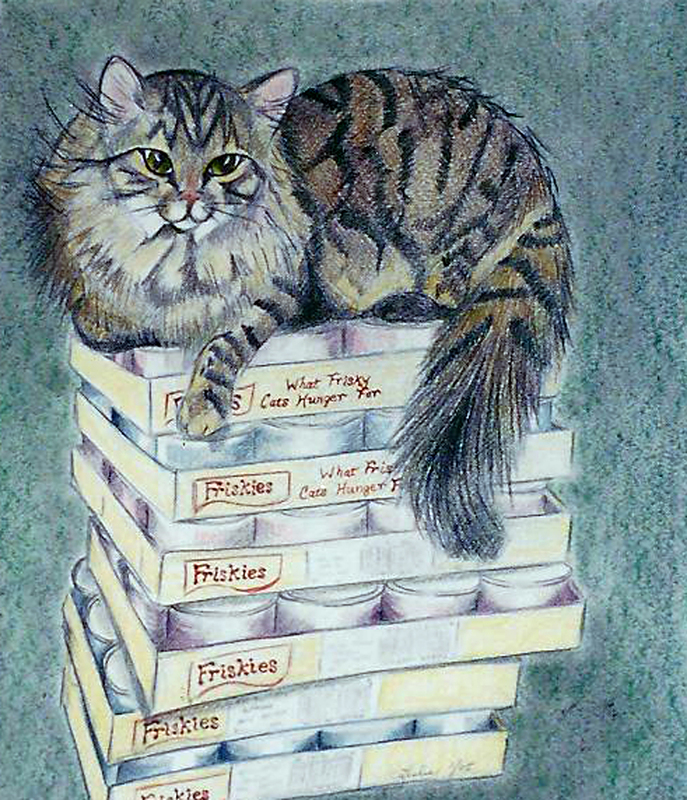 I took the reference photo for this painting the night I was trying for a photo of Biskit. I was drawn to all the overlapping shapes. He was sleeping on one of those cat stands, suspended in dreams. 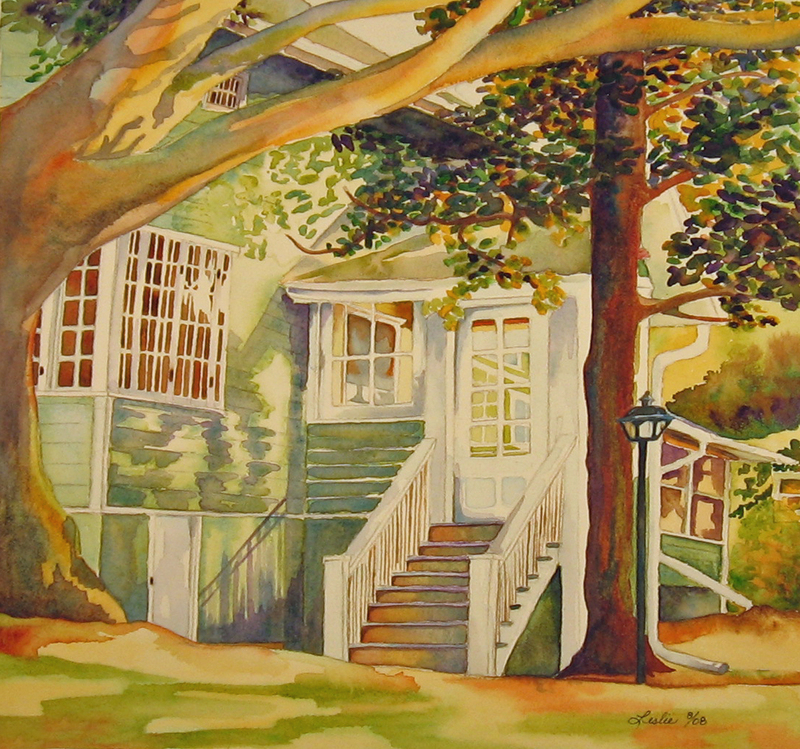 I have probably broken every guideline of watercolor while I painted this by using the white and muddying the tree trunk. I did not mind at all and just let this painting lead me. As promised, I have put together a step-by-step of how I am preparing the masa paper for use in my paintings. I recently purchased this paper from our art supply store. It can be found online, also. In the previous post, I included links to some sites where I became inspired and learned how to do this. Masa paper has two sides to it. One is soft and a little fuzzy. The other side is smooth and somewhat shiny. The instructions were to draw your image on the shiny side. I have done that twice, now. Both times, the image has washed off the paper. I think it could be achieved by using ink or crayon but I have not attempted that as yet. For future paintings, I am just going to do the drawing after I have wet and toned and glued the paper down. Mark some corner of your masa paper on the shiny side with ink in a lower corner so you will know which side is which and crumple the paper. 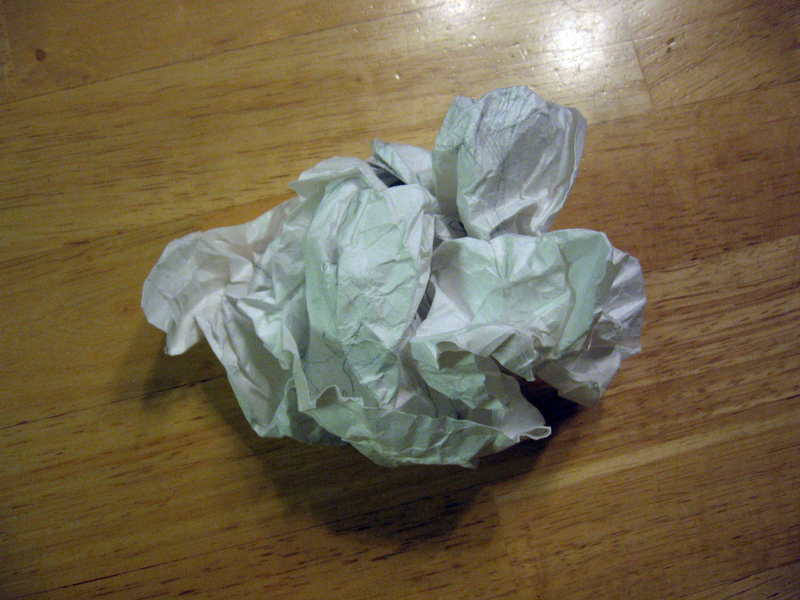 I crumple the paper, open it gently and crumple it several times. This gives me many little hairline wrinkles. 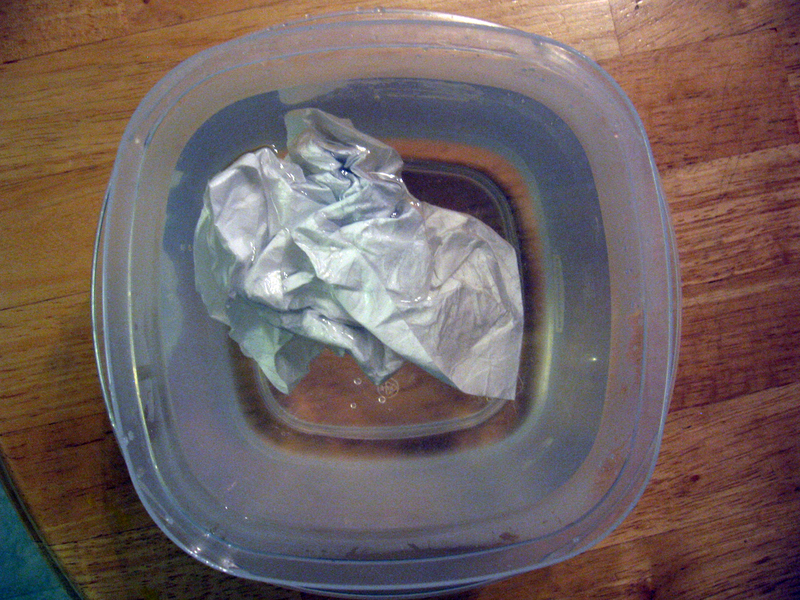 Place that ball into a container of warm water and let it soak through. This does not take long. and gently open it (it is very fragile at this time, so be careful not to tug and create tears) and lay it shiny side (marked side) down on your board. I lay it atop scott towels as the next step is a little messy and the paint can bleed through to the board and stain it. 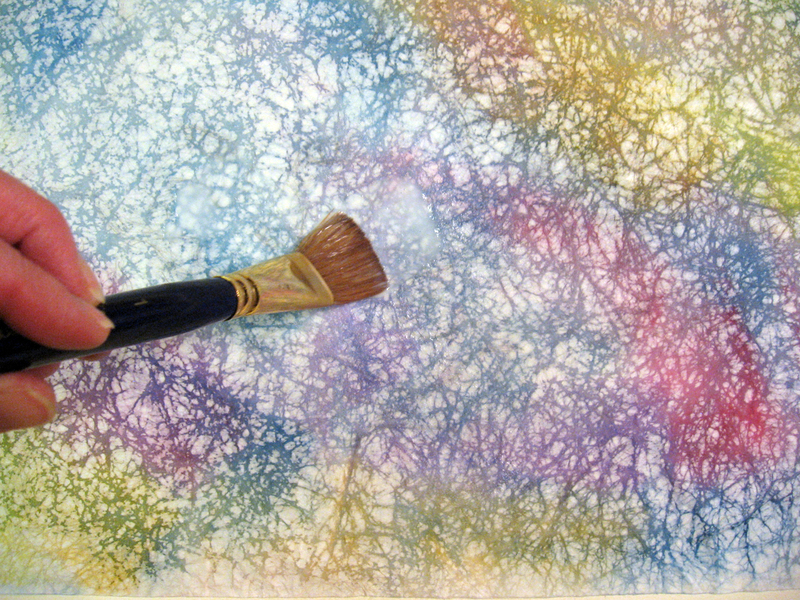 While the paper is still wet, apply large washes of color. This color bleeds through the paper as well as settles a bit darker in the wrinkles. If you are concerned about certain colors in certain areas, remember your image is reversed in this step and plan accordingly. While you are waiting for the above masa step to dry, tape down a piece of watercolor paper to another board. The watercolor paper should be larger than the size of the masa that you have just stained as you are going to glue it to this surface. I used 140 lb coldpress paper for this. I mixed two thirds acrylic matte medium with one third water to make my glue. Other artists have used wall paper glue and white glue with success in this stage. I applied the glue to the fuzzy side, or non-shiny side of the toned masa paper. 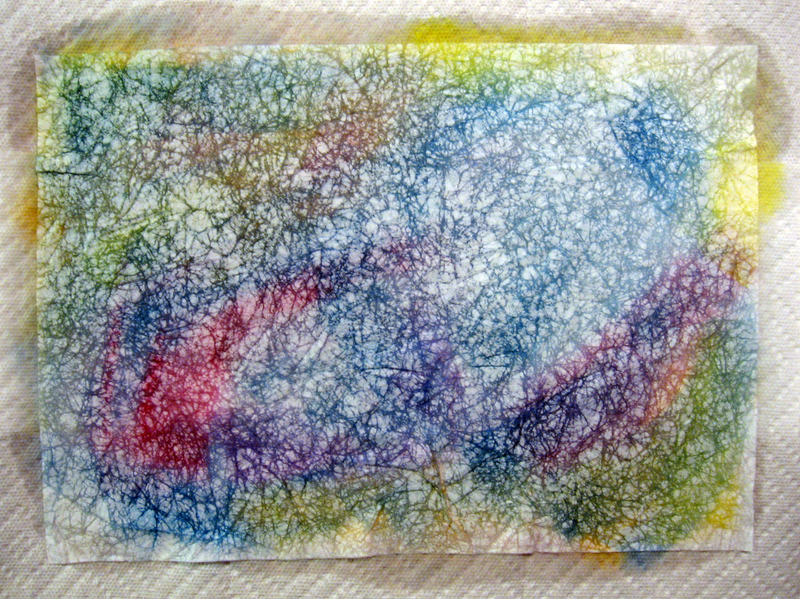 I covered the surface with it as I did not want air bubbles to gather beneath it as I glued it to the paper. I then flipped this over and set it on the watercolor paper I had previously taped to a board. I used my brush with matte medium to stroke the paper flat working from the center out to chase air bubbles. Other artists have used brayers or rollers to roll this out flat. I did not worry about bumpy wrinkles I was making as I did this. The more wrinkles; the more the texture. I waited for this to dry. I waited until the paper went flat again. Remember that I said I washed off my initial drawing? In this step, I redrew my image on the toned masa. I think this is how I will proceed with future paintings I do on masa. I could take some time to prepare my toned papers and have them dried and ready to select from when I want to use them. Then I painted. 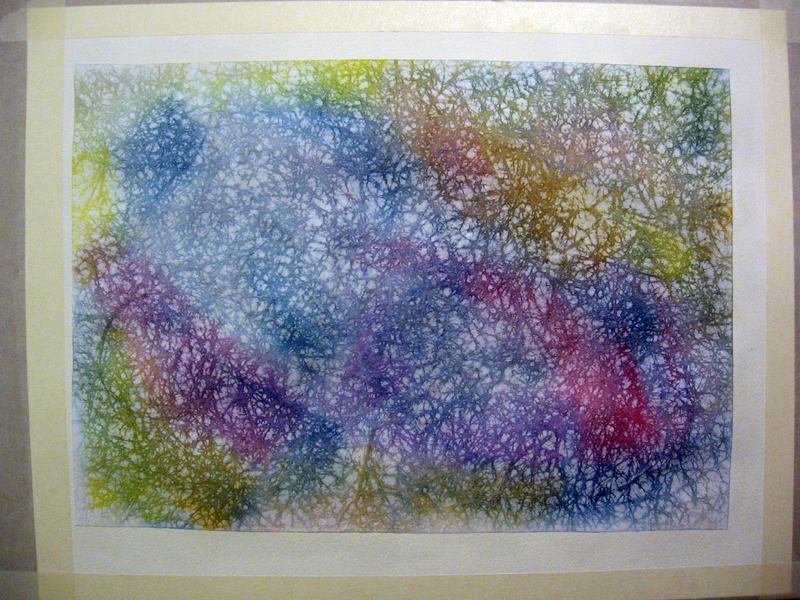 I had wanted to see how this looked using darker pigments and if the pattern would show through. I mixed varying amounts of yellow, blue and red to create my blacks for Clyde. When I first applied the darks, I did not see the pattern and became disheartened by that. As it dried, the pattern began poking through. In this step I experimented with using titanium white watercolor to define Clyde’s texture in his coat as well as to shape his legs and face. I really liked how this paper took the white! I shadowed under the ball and alongside his foreground back leg in this step, also. 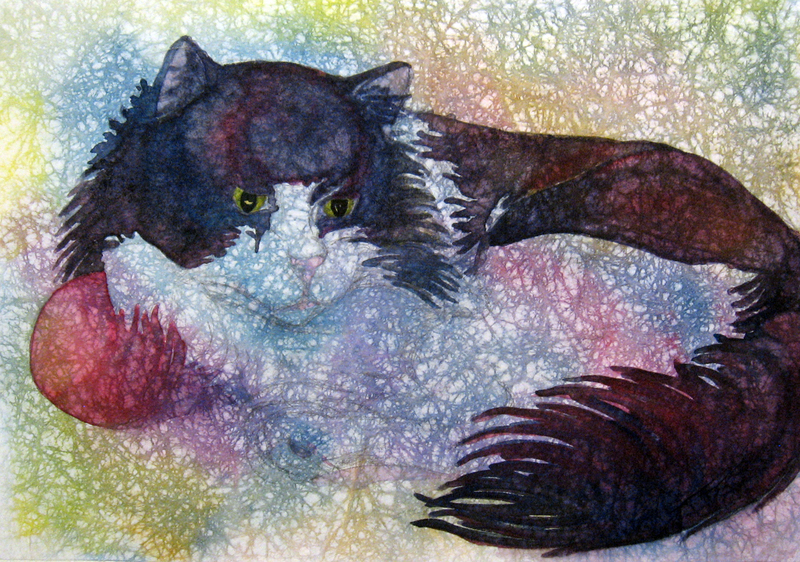 For the final step, I drybrushed his whiskers in with titanium white watercolor. After having worked with this paper a couple times, I am thinking of all sorts of uses for it as a support for drawings, paintings and collage works. 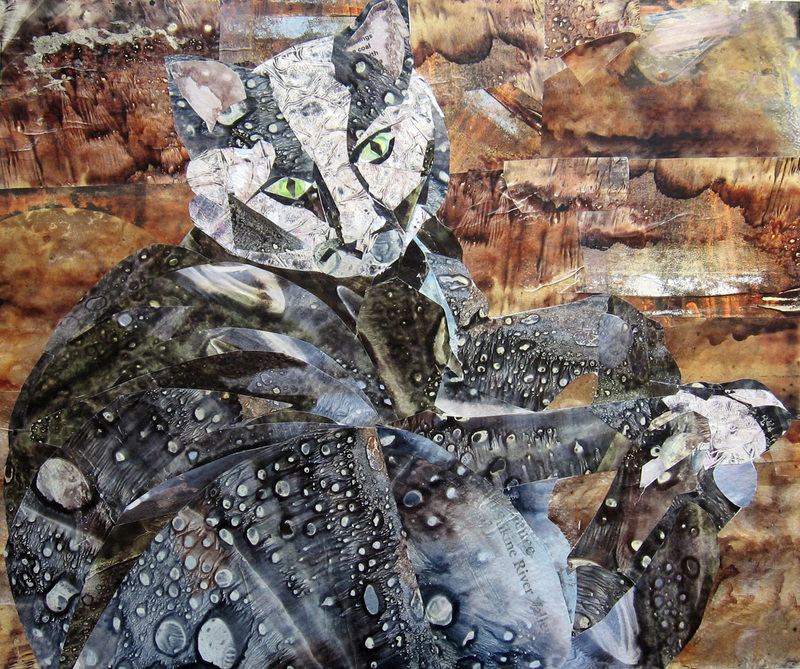 I can also make up many toned papers to be used as torn pieces of collage papers in other compositions. I have added an update to this tutorial, here, illustrating what the toning of the paper looks like prior to glueing and after glueing. 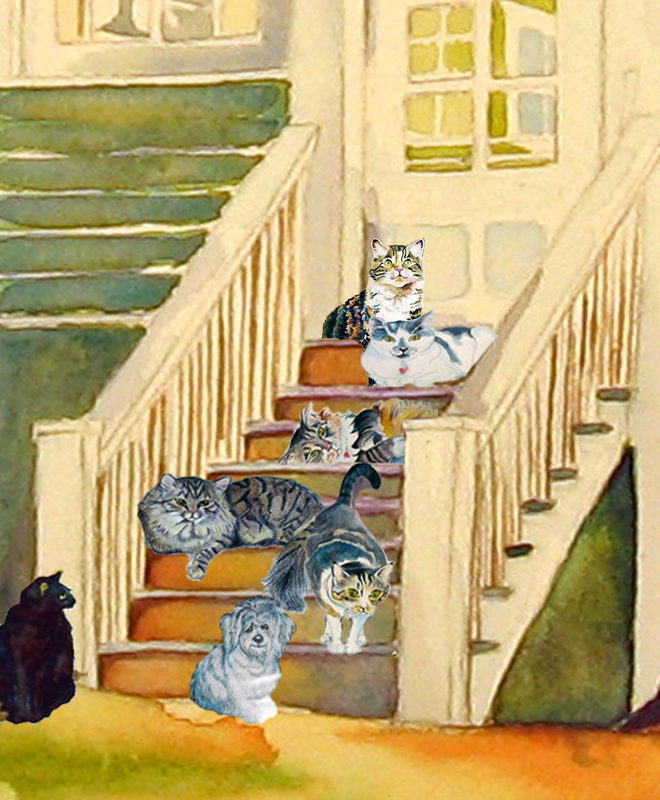 Who Let The Cats Out? The little dog on the bottom is my little Maltese, “Tucker”. I could not resist. I have tried a new paper, once again. I ordered it through my friend, Dissengallery Blog’s art store located in her blogroll. The paper is another Cartiera Magnani and is described as “Toscana acquerello”. It is 140 lb. rough paper. I have tried the 140 lb coldpressed here , here and here. Once again, I am impressed with it’s brightness and how the color is magnified. I like these papers, very much, for quick watercolor sketches where many layers are not applied. The surface is a little harder and the pigment lays more on top allowing for scumbling and shaping the image. I approach these paintings much like I do a drawing only with a brush. 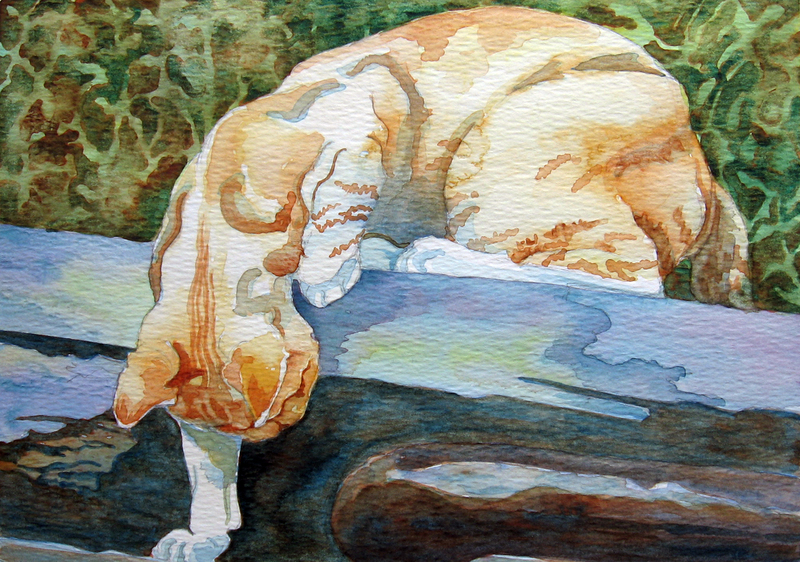 I like the wet look it offers when washes meet washes evidenced here by the dark area that the cat is peering into. 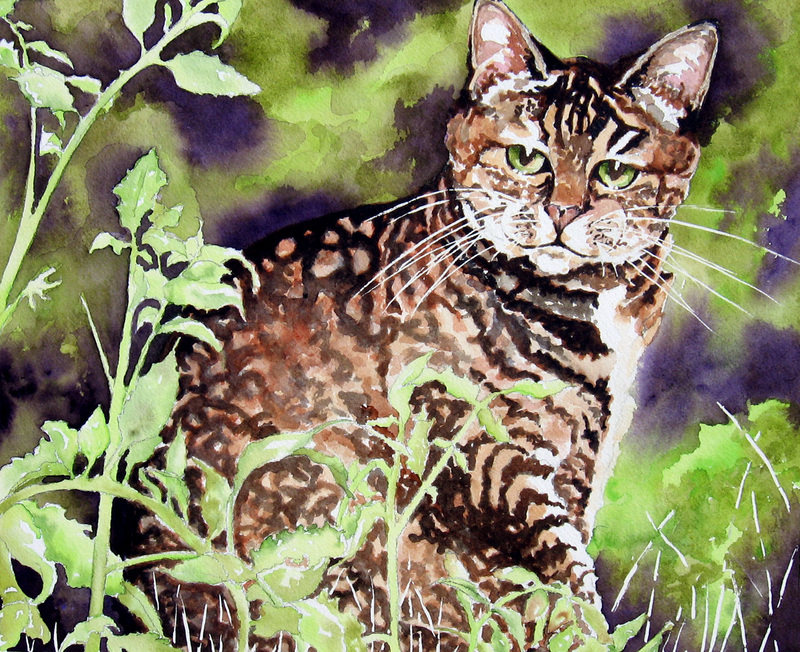 The foliage was rendered by my applying a flat wash of green and yellow, allowing it to dry and then painting in a camouflage-like pattern using darker green and burnt sienna. After that pattern dried, I went back in with a wet brush and scumbled those colors around and into one another taking care not to disturb the pattern completely. 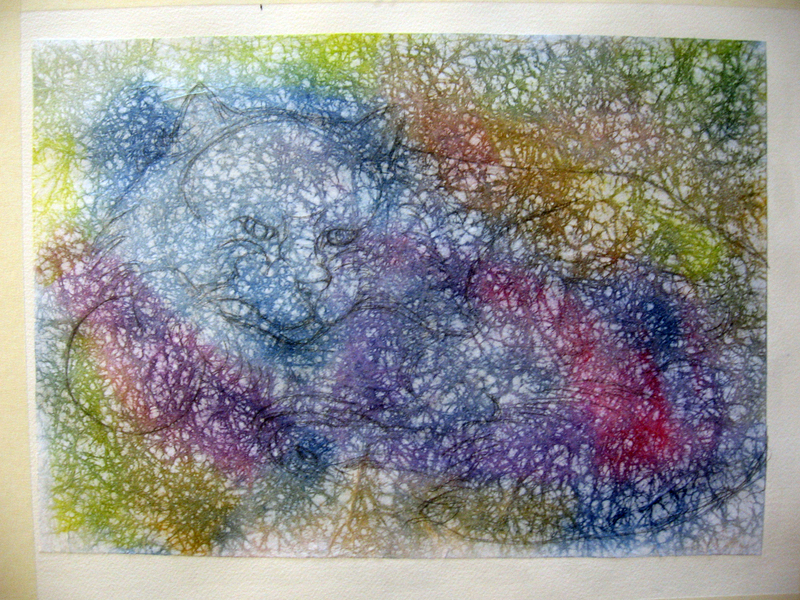 I painted the cat much like a drawing and toned her, first, with a staining wash of blue and then added the color. This is not to say that the paper can not be pushed furthur. I have pushed the cold pressed furthur here. I found that I had to plan the colors well as I knew I would pick up the previous layer with subsequent ones. The pad is small, 9 x 12, and I usually don’t work smaller than 12 x 16, so I will reserve this paper for small compositions and portraits of this nature. It is a nice activity from my larger paintings. It is important to note that I receive no compensation for sharing my experiences with this paper. It is purely my views and what I experience using the skills I have acquired.